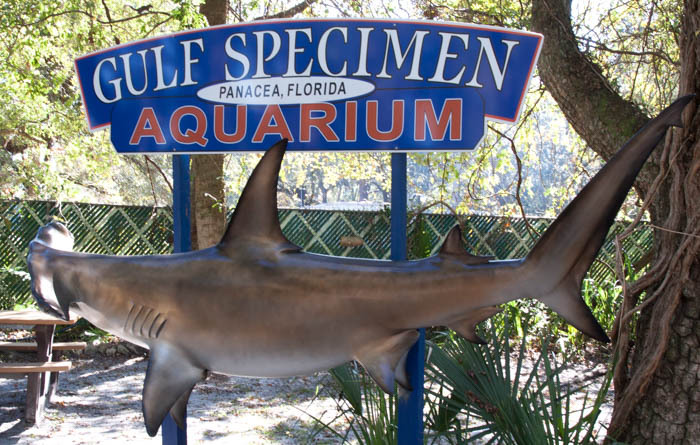 Panacea’s Gulf Specimen Marine Laboratory is the “real deal”, founded by Jack Rudloe in the early 1960s to provide marine specimens to scientists and researchers. The facility has grown over the years, to become a full-fledged tourist attraction, while still delivering sea creatures of all sorts to educators and scientists. A trip through the “aquarium” will give you a first hand, and often hands-on, look at octopuses, horseshoe crabs, turtles, stingrays and even jellyfish. From Tallahassee: Take US Hwy 319 (Crawfordville Hwy) south (approx. 15 miles) to US Highway 98 Coastal Hwy. Turn left on Rock Landing Rd (go approx. 4 blocks). Turn left on Clark Drive, the aquarium is approximately 3 blocks on the left. From Apalachicola: US Highway 98 Coastal Hwy east(approx. 48 miles) past Alligator Point to Panacea turn right on Rock Landing Rd(go approx. 4 blocks) turn left on Clark Drive the aquarium is approximately 3 blocks on the left. From St. Mark’s: Take US Highway 98 Coastal Hwy west (approx. 17 miles) to Panacea turn left on Rock Landing Rd (go approx. 4 blocks) turn left on Clark Drive the aquarium is approximately 3 blocks on the left. And if you’re hungry before or after your visit to the aquarium, stop for lunch or dinner at Posey’s Steam Room & Oyster Bar, on Coastal Highway (US98), for an excellent plate of fried shrimp, oysters, or local mullet. They’re friendly, too–and the food’s great!